I've been thinking about blogging for a year now. I've been so positively impacted by bloggers; in fact, I am a better teacher today because of what educators have been willing to share through their blogs. My life pretty much consists of family, work, and church. I'm fine with that, but I'm beginning to feel it's time to contribute in this community that I seem to belong to now. But, I've struggled with this idea of blogging; mainly, I have wrestled with not believing in myself and not knowing what I even have to say. But, today is the day! 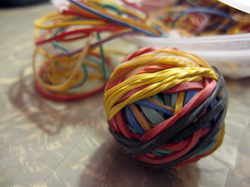 I've always wanted to make a rubber band ball. Perhaps I'm just not patient enough. It's always been on my mind ever since my best friend made one in the second grade. I truly have always wanted to make one, but at the same time, it just seems pointless. My pastor helped me realize something extremely important, and I want to share it. I invest too much in the here and the now, and I'm going to die. Now, I don't know when I'm going to die. I didn't receive bad news at the doctor's office. I just know that one day, I will die. I was doing what I normally do in church like checking Twitter, watching the time, and looking at the day's upcoming games when all of the sudden the pastor said, "Our stuff is in our hands a very short while." I sat there thinking that everything I have in this world will not go with me when I die. Well, thanks pastor for the uplifting message. That's what I normally would have thought, but rather than criticizing his statement or making a smart comment to my wife, I actually tuned in. I was actually thankful for this information because I knew it was true and that I needed to face this fact. Since Sunday, I've actually been thinking that my life is like a rubber band ball. It's cool, but what's the point? I'm just placing rubber band on top of rubber band day in and day out. I'm doing this or doing that, and going here or going over there, and it's pretty fun. Now when you come to the point where you are comparing your life to a rubber band ball, something needs to change. I do believe that one day I will have a home in heaven, and I realize that my stuff here on earth will not be going with me. This fact has helped me realize that I want to live my life with forever in focus. When forever is my focus, my life here on earth will be shaped by God's will and not my own. He is guiding me and leading me to invest in that which is eternal. Toward the end of the pastor's message, he said, "You only get to keep what you give to God." It's time I start focusing on the things that matter. I don't think I'll ever get around to making that rubber band ball. I am a husband, a father, and a teacher.